Thus Chalkley J. Hambleton begins his pithy and engrossing tale of participation in the Pike's Peak gold rush. Four men in partnership hauled 24 tons of mining equipment by ox cart across the Great Plains from St. Joseph, Missouri, to Denver, Colorado. 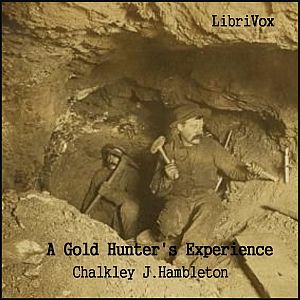 Hambleton vividly recounts their encounters with buffalo herds, Indians, and"the returning army of disappointed gold seekers." Setting up camp near Mountain City, Colorado, Hambleton watched one man wash "several nice nuggets of shining gold" from the dirt and gravel, only to learn afterwards that "these same nuggets had been washed out several times before, whenever a 'tenderfoot' would come along, who it was thought might want to buy a rich claim." Two years later, "tired and disgusted with the whole business," Hambleton returned to Chicago, where he arrived "a wiser if not richer man."